There is rather a charming tradition these days of combining cookery with stories of the way of life that inspired the recipes. In keeping with this, George has spiced her recipes liberally with family anecdotes. “Food and memories are interconnected. Most of us have everlasting memories that are evoked by the foods that we prepare or eat, don’t we?’ George says. While containing 150 recipes that encapsulate the richness of Syrian-Christian cooking, ‘The Suriani Kitchen’ also gives you a sneak peek at George’s family secrets. She had a beautiful aunt who faded away tragically young from a broken heart. Her grandmother, that matriarch normally draped in traditional voluminous veilings, took medicinal mud baths in the courtyard of their family house in Kerala every Tuesday wearing only a thin sheet. The family elephant, pampered with his favourite gruel had to be shot because he killed his mahout for spilling the boiling hot dish accidentally on his foot. The most entertaining of the stories is possibly that of Missy, the cook that every Syrian-Christian hostess coveted for her light hand with the cooking pots. But everything about Missy was not as it seemed – she hid a shocking secret beneath her skirts which was only brought to light by the nuns who gave her hospitality. 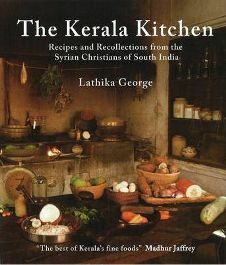 You are taught how to break coconuts – easy in the Suriani kitchen but very difficult when transplanted to New Jersey where American kitchen counters can end up spattered with coconut flesh – the American reference is also possibly because the book was originally brought out by US publisher Hippocrene as The Kerala Kitchen. Or there’s the praise song to toddy which, we’re told, tastes like champagne at its best, along with advice on how to find the best toddy shop in Kerala – off Highway 47 on the road to Alleppey. And there are quotations from the Kerala Kalpam, a quaint Sanskrit manuscript which lays down rules for looking after the fields. Farmers should be calm, orderly men who sing their bulls into the fields rather than prodding them with sticks. Old Malayalam tales and spice definitions intersperse the recipes which are laid out in different sections. Most of the recipes invite you to try them out and are quite tempting for beginners because of the handy footnotes accompanying them. There is the expected non vegetarian blend of chicken, sea food and pork, along with an impressive vegetarian selection that includes Fresh Cashew Sauté, Wild Mushroom Sauté and Spiced Cooked Buttermilk. And of course, George’s cooking medium of choice is coconut oil – she even has a brief paragraph which tells you that in her opinion it’s the finest she knows – but she’s generous enough to allow non Keralites to cook the dishes in whatever oil they choose. Blend this with the charming illustrations by George’s sister Latha George Pottenkulam and historic photographs and you have a delicious potpourri. One Comment on "A Delicious Potpourri"
Recently my sister sent me your book “The Suriani Kitchen”. What can I say, except that it has given me hours of delightful reading & wonderful memories. As we hail from Kerala (Cannanore or Kannur as it now called) so much of the content in your book is familiar! I have enjoyed not just reading & preparing some of the recipes on offer, also the cultural snippets you have slotted in and the photographs that are so reminiscent of the old Kerala kitchens!